Posted: Monday, March 21, 2016. 9:33 am CST. Posted: March 21, 2016. 9:05 a.m. CST. 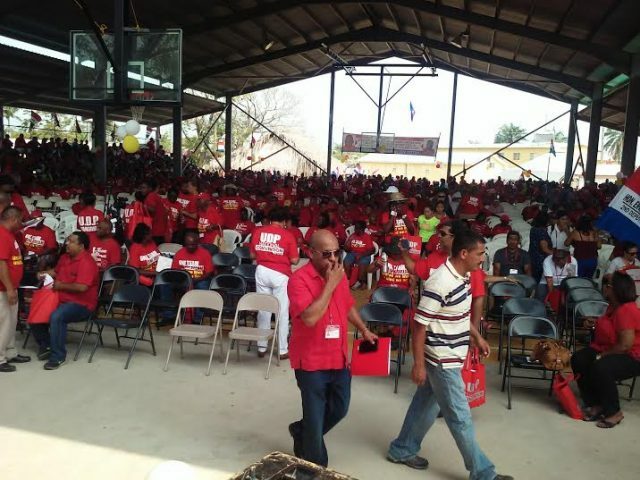 By Aaron Humes: Under the theme “One Team, One Dream: United we work, United we win,” the United Democratic Party (UDP) travelled to Dangriga on Sunday for its National Convention. Prime Minister Dean Barrow and his entire leadership executive minus Deputy Prime Minister, Gaspar Vega were endorsed. Those persons are Cayo West area representative Erwin Contreras who will continue as 2nd Deputy Party Leader, and Alberto August, and Mayor of Punta Gorda Town, Fern Gutierrez to remain as chairman and deputy chairman. They will serve until the next National Convention, whose date has been officially changed. As it relates to First Deputy Party Leader and Deputy Prime Minister, Gaspar Vega, you will recall that he wrote to the party two weeks ago to indicate that he will stand down immediately from that post and will not offer himself for re-election in Orange Walk North. That news has shaken the party right up to its leader himself. Barrow admitted a personal sense of loss at the sudden departure. Nonetheless, he had only the kindest of words for his former right-hand man. We will have more on the jockeying for power occasioned by Vega’s departure, later on. Meanwhile, Dangriga native and Duke University professor, Dr. Arlie Petters appeared as the guest speaker. He called for a renewed interest in nation-building and implored the Government to pay attention to the most marginalized people and to recognize and assist those working in the community. Later, the United Democratic Party unanimously approved two amendments to its Constitution. The first deals with the appointment of the party’s Secretary General, to the Central Executive Committee. That post is currently held by Pearl Stuart. The second, more significant amendment deals with granting the National Party Council powers to select the date for the Convention as necessary. Specifically, they wish to delay the next Convention to beyond January 1st, 2020. The only exception will be for special conventions to elect party officers due to resignation, death or removal from office. The Convention is generally held the first weekend in October in every odd numbered year. The current convention was delayed from February of 2013. A total of 6 hundred 89 delegates of 7 hundred 6 eligible were present and voted. Policy statements on women and youth were read this afternoon following lunch. The party also honoured outstanding members including former leader Dean Lindo and retired Secretary General, Phillipa Griffith-Bailey.